In a story first that first broke at Philadelinquency, we can now say for certain that the signature found at the bottom of Councilman Johnson’s 2014 annual campaign finance report is a forgery. To the naked, untrained eye, it is pretty clear that the signatures between two reports do not match, not just based on the variations in handwriting, but also in the apparent misspelling of Johnson’s own name – “Kennyatta”. One can also tell because the person who forges Johnson’s name in the second page in this image also clearly doesn’t have Johnson’s phone number memorized, something the real Johnson would probably know. The campaign was so careless that they didn’t even go ahead and add in this information later. These reports are one of many benchmarks set by government to hold candidates and elected officials accountable to the public. They ensure that those seeking public office follow all the rules and guidelines for collecting signatures and raising money for their candidacy, because the person has to sign their own name at the bottom, attach their own sense of credibility to the activities of their committee. Just in case that’s not a big enough incentive for a politician to act with integrity, it is also mandated that these reports be notarized. You may recognize the name of the notary who sealed the fraudulent document (the bottom page). Well, I immediately did, because he was part of one of the first major stories I broke as a contributor at Keystone Politics. 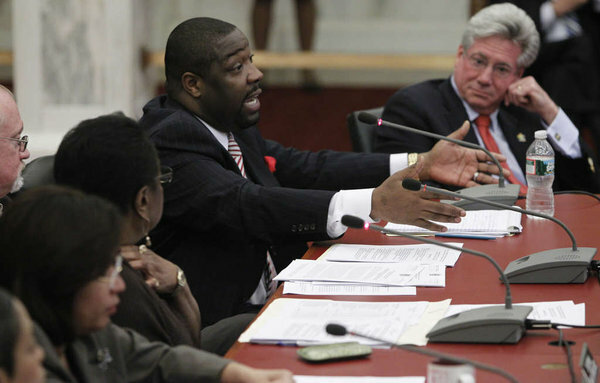 Tariq Ellis gained infamy in his role in Former State Representative Babette Josephs’ challenge to State Representative Brian Sims in 2014. He was the notary who not only sealed petition forms that contained hundreds upon hundreds of fraudulent signatures, but also sealed the documents with his special stamp knowing all too well that the petition collectors who assured that these signatures were authentic were lying about their own identities. There were also a bunch of signatures that were thrown out purely because of things like ditto marks below dates and addresses, which automatically disqualify the validity of signatures according to petition collection standards for candidates. What launched this story into the stratosphere was the unlucky choice that members of Josephs’ campaign team made to forge the signature of Duncan Black, a resident of the 182nd District. He is none other than Atrios, the creator of Eschaton Blog, and a fellow at Media Matters for America. This blogger, who I personally read, gets hundreds of thousands of clicks a year, and Josephs’ team had no clue. They even forged the signature of his former room mate, who doesn’t even live in Philadelphia anymore. Josephs’ team was dishonest about a lot of things in their petition collection drive, but what really made me gasp as a journalistic observer of the debacle was their legal defense at trial. As Sims’ legal counsel, Adam Bonin, presented all of this to the judge, and as he was prepared to present testimony of an individual who the Josephs campaign team claimed collected signatures but who had no affiliation to the campaign, Josephs’ legal counsel decided an effective way to gain favor with the judge in her verdict was to make excuses. One of the other petition collectors, whose address is incorrect, whose name and signature are clearly written in multiple handwriting styles, and who, through Bonin’s investigations, appeared to be homeless at the time that petitions were being collected, could not be found to testify on Josephs’ behalf. If you’ve never had to notarize something, this all may feel really confusing, but in order to notarize a person’s signature, the notary public must have the person sign, in person, with identification present at that time. There isn’t a scenario in which most people could trick a notary. In other words, the notary public who notarizes something that should not have that seal is at best ignoring the standards and practices of their position, and at worst, they are coordinating with a candidate or public official wishing to dupe the public. I just want to remind people that the threshold to become a candidate on the ballot for state representative is actually pretty low. You just need 300 signatures of residents within your district who are registered for the party of which you plan to run. You get a few weeks to do this, you notarize the pages, and you turn them in for inspection in Harrisburg. Given the power of a state representative, and their broad constituency of tens of thousands of bipartisan voters, this is not that hard of a benchmark. Josephs’ team cheated at every possible opportunity, and Tariq Ellis was part of that team. Now he’s notarizing paperwork that Johnson is required to fill out himself, review himself, and approve himself to ensure accountability of his own staff and consultants. Peace Not Guns, Inc. is not now and never has been a federally registered non-profit. There is no record of it in the IRS database and it has never filed any of the financial reports that are required for such organizations. It also does not appear in state listings of approved charities. Christopher Sample, Johnson’s chief of staff, readily admitted as much when contacted by AxisPhilly, and said that the councilman has not kept any financial records for Peace Not Guns. AxisPhilly also noted that this had real complications, not just ones of a political theatre scale. When this story was first reported, Walmart had on their website a press release discussing their pride in supporting the “nonprofit”. It was quickly removed after conversations with press looking for comment. It gets even better. Though Johnson’s latest paperwork shows that they use a different notary now, Tariq Ellis is still commissioned as a notary public in good standing, according to public records displayed on Pennsylvania’s notary search site. One would think, given that notaries serve as the final safeguard to the public for institutional honesty, that his deplorable display of dishonesty in the Josephs episode would have raised alarm bells for those in Pennsylvania government who commission and decommission notaries public. Nope. I’ve seen his name stamped on campaign finance reports of many Philadelphia public officials. Now isn’t the time to start listing off names, but I hope that this piece will incite the impetus for those who have done business with Tariq Ellis to call for his decommission as a notary public. The Division of Legislation and Notaries of the Bureau of Commissions, Elections and Legislation administers the duties imposed on the Secretary of the Commonwealth by Pennsylvania’s Notary Public Law. The Division works on behalf of the Secretary to appoint, commission and regulate all notaries public in the Commonwealth of Pennsylvania. For over 200 years, notaries public have been officially recognized by the Commonwealth for administering oaths and affirmations, certifying copies and taking depositions, affidavits, verifications and acknowledgements. Notaries public in Pennsylvania certify, verify and acknowledge hundreds of thousands of important documents each year. More than 80,000 men and women hold notary public commissions in Pennsylvania. Can we make it 79,999? Please? Editor’s note: This post originally appeared on The P.H.L. Colleen Kennedy is the creator and editor of The P.H.L., a site founded to help fill the need for more long-form policy analysis in the Philadelphia region. Above all, Colleen cares about equality of opportunity and transparency of government. Contribute to The P.H.L. to keep analysis like this going.